If solar activity has a sginificant impact, then if sunspot numbers remain low, we should expect to see a temperature decrease similar to that observed during the early 20th century. It is too early to tell if the recent flattening will be a top similar to the previous two. Response: [Dikran Marsupial] What temperature decrease in the early 20th century? 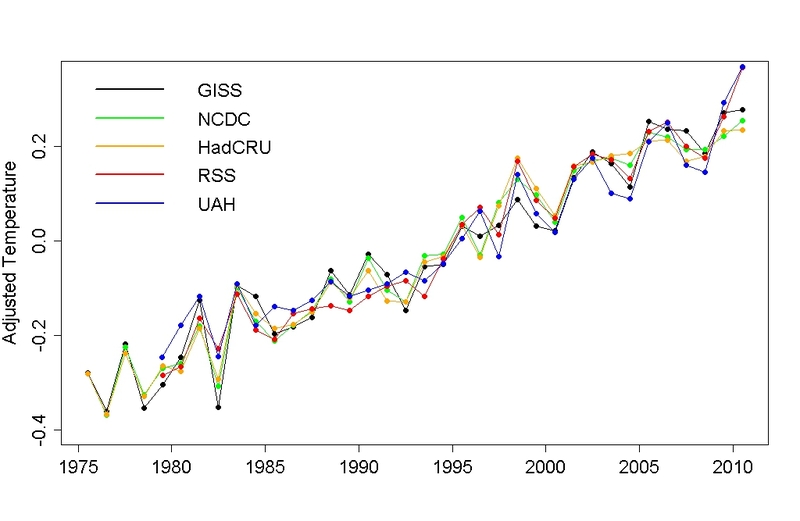 You do understand that decadal trends are not robust and signify very little? The 0.2 - 0.3C drop that occurred from 1880 - 1910. Sorry if I should have said late 19th / early 20th century, but I thought it would have been evident to anyone reading. See Tom's post of 899. Response: [Dikran Marsupial] The point is that you need to show the data that demonstrates your point, in this case how solar forcing affects temperature. At the moment your comments are too vague to convince or to refute effectively. The comment about decadal scale trends also applies to the present time, can you demonstrate that the current levelling off is forced or just the result of internal climate variability. If not you shouldn't be making arguments about what it means. EtR#900: "does that negate the fact that an increase has occurred?" The recent divergence between solar activity (decreasing, as measured by ssn) and rising temperature anomaly in this graph is obvious. That ssn 'increase' is over - and yet we're still warming. That's what the data show - what you 'believe' cannot negate that fact. That observation alone should cause you to question those beliefs; to cling to beliefs that so utterly conflict with data is a sign of one who is in denial. EtR#901: "too early to tell if the recent flattening will be a top"
Not seeing any flattening here either. Overall, the combined global land and ocean surface temperature for July 2011 was the seventh warmest July since records began in 1880, with an anomaly of 0.57°C (1.03°F) above the 20th century average. I suppose if you buy into the 'global warming stopped in ___' meme, you should see one of those threads. Every energy source accessible to the human species is created – either directly or indirectly – through nuclear reactions powering the sun and stars. Every atom of our planet – from the fissionable atoms of uranium and plutonium, to the carbon, hydrogen and oxygen atoms of our bodies, comprise the end products of nuclear processes. The numerous chemical, physical and nuclear quanta of energy transiently packaged within coal, oil, gas, wood, food, geothermal, hydrothermal, hydroelectric, wind, wave, electromagnetic, heat, solar, uranium, plutonium, hydrogen, neutrons and protons, are all sourced ultimately from fundamental nuclear reactions occurring deep within the sun and stars. No energy source is renewable in nature, only degradable, degrading inexorably with time as a cascading decay of energy states from protons through to coal. This inescapable degradation is enshrined as physical law: the second law of thermodynamics. In common with other stars, the sun steadily releases this energy as gamma radiation, deep within its central core, and primarily through the proton-proton reaction (ref1), the same nuclear reaction that powers the hydrogen bomb. In this simple reaction, four hydrogen nuclei fuse together to make one helium nucleus, releasing in the process 26.73 MeV (or 1.02 x 10^-22 ton oil equivalent) of energy in the form of gamma rays (ref2). Streaming out from the sun’s central core at some 10^38 per second (ref3), the gamma ray photons are continually absorbed and re-emitted as less energetic photons, eventually reaching the surface of the sun and escaping into surrounding space primarily as photons of visible light, along with sizable amounts of every other form of radiation. It is this lethal flux of radiation that has irradiated the naked Earth for 4.5 billion years now. It is this radiation which powers, supports, initiates and drives (through genetic mutation) the numerous processes of biochemical diversification we call life. It is this radiation which directly and indirectly, creates, supports and controls the so-called biosphere of life-tolerant conditions on Earth, conditions that nourish, support, protect, evolve and eventually extinguish each species of life on this planet. Energy is radiation. Radiation is energy. The ultimate source of both is nuclear. It is that simple in nature. Humanity’s real problem comes with the politics of energy, a vastly more complicated and intractable issue altogether. An issue it seems, which dare not be stated in four hundred words, far less solved. [DB] Rambling dissertations aside, do you have a point with this? I have seen a chart which shows the record of daily hours of sunshine in England, gradually increasing over 50 years, and correlating with temperature increase in UK. Sunshine Records must go back many years, in many places. Are there any global analyses of sunshine hours from the various sources? lancelot, can you cite a source for the supposed increase? I'm also not sure what you mean by 'sunshine hours'. Are cloudy days excluded? If so, at what 'level of cloudiness'? If cloudy days are not considered then the number of hours that the sun shines on various parts of the Earth is entirely a factor of the planet's orbit and inclination... and thus should not be showing any significant long term variation. In any case, satellite readings of total incoming solar radiation should be far more accurate than whatever measurement is being suggested here. •	Variations in the intensity of the sun’s magnetic field with cycles including the Schwabe (eleven year), Hale (22 years) and Gleissberg (70-90 years). •	Effect of the sun’s plasma and electromagnetic fields on rates of the earth’s rotation, and hence the length of the day. •	Effect of the sun’s gravitational field through the 18.6 year Lunar Nodal Cycle, causing variation in atmospheric pressure, temperature, rainfall, sea-level and ocean temperatures, especially at high latitudes. •	Known links between solar activity and monsoonal activity, or the phases of climate oscillations such as the Atlantic Multidimensional Oscillation, a 60-year long cycle during which sea surface temperatures vary about 0.2°C above and below the long-term average, with effects on northern hemisphere air temperature, rainfall and drought. •	Magnetic fields associated with solar flares, which modulate galactic cosmic ray input into the Earth’s atmosphere. This in turn may cause variations in the formation of low-level clouds. This causes cooling: a one per cent variation in low cloud cover producing a similar change in forcing to the estimated increase caused by human green-house gases. 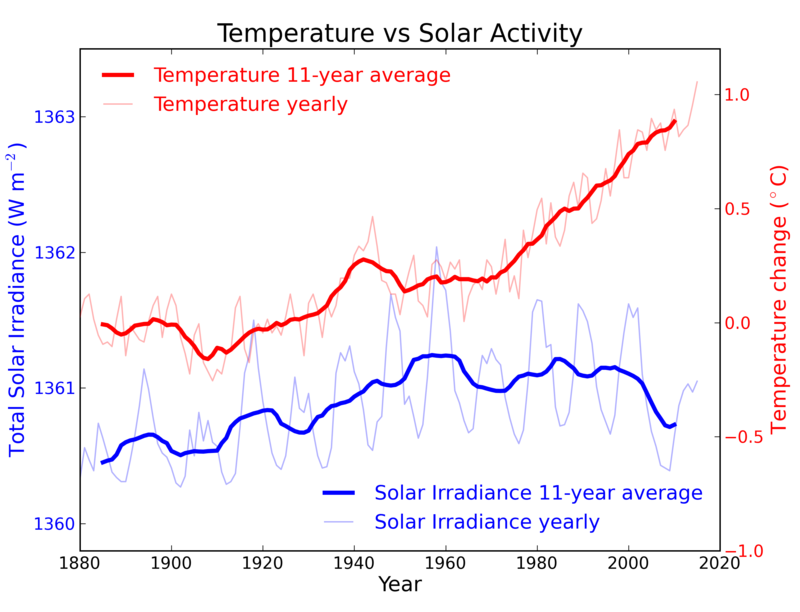 As Robert Carpenter (2010) has stated: “That many of the mechanisms and possible mechanisms by which the sun influences Earth’s climate are poorly understood is no justification for ignoring them.” Of immediate relevance is the fact that solar cycles longer than the eleven year average are followed by later cycles of lesser intensity, and with it a cooler climate. According to Archibald (2010), Cycle 24 may produce cooling of up to 2.2°C for the mid-latitude grain-growing areas of the northern hemisphere. This may have already started. Dr. Vincent Courtillot, who is a professor of geophysics at the University Paris-Diderot and Chair of paleomagnetism and geodynamics of the Institut Universitaire de France, has pointed (2011) to the failure of climate models in relation to the sun. He notes that while the total solar irradiance (TSI) only varies by about 0.1% over a solar cycle, the solar UV varies by about 10% and that secondary effects on cloud formation may vary up to 30% over solar cycles. The IPCC computer models dismiss the role of the sun by only considering the small variations of the TSI and ignore the large changes in the most energetic and influential part of the solar spectrum – the ultraviolet. jpenhall 46: What an incredibly poorly informed screed. It should be noted that the IPCC has examined potential additional effects from the sun such as the purported effects of Galactic Cosmic Rays (modulated by the solar magnetic field). However, most of the items on your list have no known causal mechanism whereby they could effect climate. Why changes of the length of the day should cause warming or cooling is completely unexplained, but you are here to criticize climate scientists, not for ignoring your alternative theory, but for not inventing it for you as well. Further, some of the items are not even solar related. For example the Lunar Nodal Cycle is, surprise surprise, a Lunar, not a solar effect. More bizzare is the inclusion of Bond Cycles (conjectured climate cooling events) as being a solar cycle. They may be, but the evidence for that has not been presented, and simply naming a climate cycle as a solar cycle is not evidence. Tellingly you equate the Bond cycle to warming events, whereas it is a cycle of cooling events with a quasi-periodicity of 1470 years. Of course, given that Bond events are multi-century events and that the last one peeked 1400 years ago, if they theory of Bond Cycles is any good, we should be in the middle of a massive cooling event at the moment, not a warming one. Ignoring all theory, however, you simply take the name, invert the sign and suppose that it is coming centuries early (based on your incorrect suposition that the MWP being the last event) as an explanation of the modern warming because, evidently, for you straw is preferable to following the clear evidence of anthropogenic global warming. [DB] If you wish to discuss the science of the OP, fine. Shamelessly self-promoting your book here is not. Future comments of this nature posted here will simply be deleted and your commenting privileges may be revoked. There is a direct relationship between the Solar Sunspot Cycle (11.028148 yrs)the Lunar Metonic Cycle (18.61 yrs) and the Earth/Solar Rotation Ratio (27:1)that affects the onset of 'Dry Cycles' on Earth. Bring on the proof! Solid evidence is always preferable to empty claims. You are still posting so you are not banned (see post 911). If you want to discuss the science here then discuss the science. State your case and provide your evidence. Provide links to more details if it is too much for a single post. This is not rocket surgery, it is basic conversational skills. "Buy my book to learn the Truth" is not at all the same thing. Yes, I was 'banned' and reinstated, with further (-snip-) warning. No, I did not try to sell anything, I offered a free pdf of the 'proofs'. (-snip-) Anyhow, here is a small taste. If you are still interested you can pursue the rest. "I offered a free pdf of the 'proofs'." If no peer-reviewed published citable sources exist your claims devolve to "climastrology". QED. My apologies if I misinterpreted DB's moderation comment @909, I did not ever see your original. I will use a more friendly tone from here on if you will do the same. The evidence you provide in @914 is not the least bit helpful without some context. It is just a Number Salad. Please provide an outline of your argument because at this point I have no idea what it is your numbers are supposed to show me. Don Gaddes - Well, that's a lot of numbers. But do they mean anything? The temperature of the Earth climate is determined by the amount of energy in it - which in turn is driven by the rate of energy in (sunlight, throttled mostly solar output and Earth albedo) and the rate of energy out (throttled by temperature, IR emissivity of Earth to space). You seem to be claiming that current temperature changes are driven by cyclic phenomena, not CO2 and other greenhouse gases. Unless these 'cycles' determine the rate of energy entering or leaving the Earth's climate, somehow modifying insolation (in ways that are not currently detected by TSI studies), albedo (again, in ways not currently detected), or IR emissivity to space, they are essentially "climastrology", "numerology". Tamino has discussed this exercise, and has most appropriately labeled it Mathturbation. the end of comment 914 indicates Don Gaddes compiled these numbers in 1990. I am curious how accurately his calculations predicted the global average temperature for the years 1990-2011. I agree - looks like more cycle-fitting. If this has any real scientific merit - publish it in peer-reviewed literature not a book. We believe in 'Gravity' though we don't know what it is. We know and can measure what it Does. A S Gaddes published the original Ratios Principle and 'Dry Cycle'forecasts numbers in 1990. There were no 'peers' to review such work at the time. The fantasy of El Nino ruled the waves. Alex Gaddes died in 1997, leaving his forecasts at 2001. Don Gaddes extrapolated the 'Dry Cycle' Forecasts from 2001 to 2055 and republished the original work including the added forecasts,in 2011. A.S. Gaddes never speculated what the 'catalyst' or 'Weather Factor'was, emanating from the Sunspot Latitude of the Sun and affecting the Earths climate as exactly predictable 'Dry Cycles'. (Recent work seems to indicate there is something to the production of ultra-violet and ozone affecting the Jet Stream.) The work does not predict Global Average Temperatures,(though A S Gaddes also worked on the concept of a 'Convection Still' in this regard.) It predicts 'Dry Cycle' onset and influence (moving around the planet longitudinally with the westward drift of the Earth's Magnetic field. )As an example, 2011 'Wet'/Normal, 2012 One Year 'Dry Cycle'(Reaching New Zealand mid-December 2011 and Australia, early January 2012) 2013-14 Two year 'Wet'/Normal period, 2015-19 a severe Five Year 'Dry Cycle'(Drought.) The previous Five year Drought was 1997-2001. The 'Dry Cycle' forecasts are exact in their arrival and duration, and can be easily proven to be so via weather records dating back into Tree-ring and Deep Ice Core analysis. I do not indulge in 'Mathturbation' or 'Climastrology' and neither did A S Gaddes. [DB] "...in 1990. There were no 'peers' to review such work at the time." So you maintain that peer-review did not exist prior to 1991? Or that Gaddes the Elder had no peer? "The fantasy of El Nino ruled the waves." If making a funny, using a smiley or Poe's Law kicks in. "Alex Gaddes died in 1997, leaving his forecasts at 2001." He published in 1990, yet his data you cite runs after his death...via Ouija board? "I do not indulge in 'Mathturbation' or 'Climastrology'"
In all seriousness, extraordinary claims require an extraordinary burden of proof. If you maintain what you do in the absence of physical mechanisms in the face of centuries of published research (which you seek to overturn with a non-peer-reviewed source) which says otherwise, then you do. This is like using epicycles to explain the motion of the planets. It is an overly complicated explanation that is required a for dogmatic rather than scientific reason. A much simpler explanation that explains *more* is avaialble if you abandon the premise that it must be cycles within cycles within cycles. If you stick with the Epicycle Theory of Climate you still need to account for the radiative characteristics of CO2, Water Vapor, CH4, etc since those are real and measurable. The 'extraordinary burden of proof' you seek will be provided in the onset of future 'Dry Cycles' (if you do not wish to bother with the historical record. )How will the GBR react with an extended period of 'run-off' in 2013-14? Or how will Australian agriculture fare with a Five Year Drought From 2015-19? South-East Queensland will be in a severe state of water deprivation. pbjamm (917) mentioned the absence of Global Average Temperature prediction. This is relevant with the AGW hype surrounding the recent BEST Report. [DB] "I'm saying there were no 'peers' working in the field of 'Dry Cycle' prediction. A S Gaddes sought and followed the advice of many scientific 'peers' at the time and many of them provided him with important papers and discussion pertaining to his work." Now you resort to "termastrology". Uncontent with the standard definition of peer review, you redefine it to make the term more convenient to your position. By not publishing the work in a peer-reviewed, scientifically relevant journal the work by definition is not peer-reviewed. This is a forum in which the science of climate change is discussed and explored. By science meaning peer-reviewed articles published by working scientists in the field in scientifically relevant papers. Nothing you have presented thus far meets those standards. Thus, the reader of this blog will be unable to differentiate between what you have presented thus far and the works of Hapgood, Velikovsky, Burroughs (my favorite is where the famed scientist Tar Zan exlores the inner world of Pellucidar) and Hubbard. But lacking the entertainment value. If you wish to further explore your claims, pick the ONE mechanism you feel most strongly about (the one you wish to "hang your hat on"), use the Search function in the upper left corner to find the most relevant thread and initiate a dialogue on it there. You waste everyone's time here with this Gish Gallop approach. "We believe in 'Gravity' though we don't know what it is." I believe this, along with your predilection for epicycles, is clear evidence that you have been transported here from the medieval period. Since your time, there have been some advances; most notably Einstein and The Internet/google/Wikipedia... you can use the latter to learn about the former and discover that we know very well what gravity is. Actually, DB, I thought it might be the lost chapter to Foucault's Pendulum or, given the overuse of capitalization and other features, a supplement to Mason & Dixon. Don, are you saying that the 'Dry Cycles' have caused the Recent Spike in global average temps? Are you also saying that CO2 does not absorb and emit at a well-defined set of pressure-broadened frequencies within the same infrared range at which the surface also emits? Are you also claiming that the observed stratospheric cooling trend is a result (somehow - physical mechanism? I don't have to show you no stinking physical mechanisms!) of these dry cycles? I'm beginning to hear a catchy tune . . . the Music of the Spheres? I have on occasion considered running curve-fitting between global temperatures and (for example) observed cicada swarming. Should be easy - cicadas have swarm cycles from 2-17 years, with heavy emphasis on prime number values. Given a stated time period of temperature data, and treating cicada cycles as sinusoids or impulse functions with delay effects, I am certain I could find a regression weighting that would match observed temperatures. Of course, that would have exactly zero explanatory value regarding the climate - cicadas do not have a causal relationship forcing global temperatures. And my 'predictions' outside the fitting range would be completely worthless. The only way to obtain a real prediction of future climate behavior is by looking at the actual physics in operation - forcings, feedbacks, etc. Such as (again, for example) greenhouse gases, El Nino variations, observed insolation, etc. - Bad statistics are a toss-up with "Just So Stories"
This is the real problem with "climastrology", such as Loehle and Scafetta's curve fitting, or (IMO) numerology such as the astrological 'cycle' fits recently commented upon. No physics connection to the climate, no mechanism, and hence correlation without causation - and no predictive value. I now present the work for 'peer review.' But that means you all have to read it! KR: Or one could use actual physics, which gives the earth's magnetic field's westward drift at 0.2 deg/yr. Mr. Gaddes' "migrating longitudinally around the planet,(30 degrees/month with the westward drift of the Earth's Magnetic Field,)" would be quite noticeable - and could hardly be called 'drift'. Muoncounter - Agreed. A 30°/month shift of the Earth magnetic field would not be a "drift", but more of a "spin". "I now present the work for 'peer review.' "
Good luck on that - however a question. The problem with this kind of forecasting, is that it doesnt forecast. If the fitted cycles have no physical meaning, then the real world will drift away from forecast in accordance with real physics. So when this happens, will you be writing an apologize to climate change victims for helping to mislead - or just redoing the fitting and publishing another prediction? Ie is there some point when you would realise the folly and stop fitting? Of course, should you be right, I would stand behind a nobel prize nomination. I will confess that I have not read all of your father's work, but I perused all of it and read much of it in what little time I had to spare. Forgive me if this is offensive, but I believe you are doing your father a great, great disservice both in the way that you present his material and what you yourself have taken from it. In this work the author has not attempted to persuade, merely to explain how he went about his study, and what those studies revealed. It will be for the reader to make his or her own judgment as to the correctness of the findings. Greenhouse or ice age, the answer may well be with us before we realise that our planet is a fragile, living form, constantly changing, and demanding respect, study and understanding, if we want our species to survive. He was humble enough to recognize his own limitations, but more importantly, he demonstrated a tremendous investment in getting people to recognize the importance of climate and climate change. He did explicitly (in his book) understand and accept the realities behind CO2 and greenhouse gas theory. His only disadvantage was that events had not begun to truly play out when his book was written and before he passed away. Weighing the pros and cons of dust and other cooling factors, against the “Greenhouse Effect,” I believe, at this stage, that the former is holding sway. And that may well have been the case, to the casual observer, in 1990, and was indeed a factor in holding temperatures down until 1979. We know that since then this has become much clearer, and aerosols no longer dominate greenhouse gases in changing the climate. I wholeheartedly agree with Professor R. Bryson, that if we are indeed facing an imminent climate/weather change (and the weight of evidence seems to indicate very strongly that such is highly likely,) then we ought to be earnestly and diligently marshalling our options now. Of course, your father's concern was with an imminent glacial period, not warming, but the sentiment rings true, regardless. And I am sure that, faced with the weight of evidence against his theory and for the impact of greenhouse gases, he would at least admit that whatever influence his natural cycles had had until this point in time, mankind's burning of fossil fuels was overwhelming those forces and making his theories inconsequential in the scheme of things. I, and I daresay by far the majority of thinking people, would agree wholeheartedly with the above conclusions. Why, then, do we not embrace Socrates’ philosophy of equating thinking with doing? So the nature of man must also be considered by the future writers of an equation for survival. I will post a separate comment with what I consider to be the failings in his efforts, but I don't want to diminish them. He was an intelligent and yet uneducated (formally) man who took wholeheartedly to his hobby, pursued it with intelligence and diligence, and whether correct in his conclusions or not he demonstrated both a humility and an investment in the importance of the subject which now deserves respect, not derision. But I would ask you to read his book a little more closely, and to read between the lines, imagining what he might say today, faced with the mounting evidence, rather than what you perceive that he had said back then. He is at a disadvantage in having you as his only advocate. I believe you owe it to him to consider all of his words, and what he himself seemed more than ready to accept, which is the idea that he might be wrong, that it is frighteningly important to be right about this, and that doing so -- being right -- means being willing to always keep an open mind, and to always adjust your reasoning to the facts as they become available. On the veracity of your father's work, I have a few points to make. First, despite the great length of the book, the vast majority (more than 99%) is mere discussion. He talks of the repercussions of droughts and climate change. He quotes extensively from the passages of other works, all of which predate 1978, which means they lack a lot of modern tools, theories and observations that simply were not available then. But, in his body of work, he does little more than do as he said he would in his introduction, which is to explain how he arrived at his cycles, without going the important next step and proving how those intricate, interwoven cycles in fact tie to any climatic events, either past or present. The first problem I see in his work is that he tied his cycles, as far as I can tell, only to records of rainfall in Australia and nothing else (and of course, he lived in Australia). His cycles are not tied to global records (rainfall, drought, or temperatures) of any sort. They are also not tied to global temperatures, but only to rainfall records. His entire theory hinges on tying drought -- Australian drought -- to his cycles, but not temperature changes, and certainly not global temperature changes. He never, ever introduces temperature records at any point. As such, his work very simply does not apply. The connection of cycles to drought to temperature is quite simply too vague to be given any weight whatsoever, especially when no such connection has even been presented by him. There is no evidence -- no effort yet -- to show that his cycles translate into a prediction that mirrors either past or future temperatures. There is no reason whatsoever (lack of physical mechanisms aside) to apply any of his work to the climate changes that we clearly see today. Beyond this, there were also clear gaps in his knowledge. I imagine that he would have been a whirlwind today, with access to the Internet to help him close those gaps. But he did not understand the Hadley cells and their effects on the arid regions of the globe and transport of moisture. This is clearly evidenced in his Appendix 4. Raising of climatic temperature to a mean, specific, critical point, somehow dissociates moisture from lower atmosphere. The more moisture used up, the drier and hotter the climate, the more dry air -­‐cooled air delivered at the Poles. He was, I suspect, confused by the fact that hot deserts are dry, and so presuming that one was the cause of the other, when in fact the two are intertwined and, in fact, the daytime heat of the desert is a result of the lack of humidity rather than its cause. According to Rankama and Sahama (Ref. No. 14) the oceans act as a sink for any build-up in carbon dioxide above a partial pressure (PP) in the atmosphere; that once the critical PP in the atmosphere is reached, the excess carbon dioxide is taken into solution by the oceans. He also includes a fair of discussion of volcanoes in his theory. Modern climate science has this pretty well nailed down, to a much greater extent than your father achieved and now at a level from which he might have benefited. But his volcanic theories go out the window as "the" driver of climate. We know this to be a fact, and there is no way to argue it, even if he had included any hard numbers to substantiate his position, which he failed to do. Should it so happen that the carbon dioxide content of the atmosphere were to become greater or lesser, then it would follow that the ”Greenhouse Effect” must vary in direct proportion. The former is just what has been found to have taken place. Man is the culprit, for during the past 50 years, due to our ever increasing use of fossil fuel. The mean carbon dioxide content in our atmosphere has increased by about 13.5 percent, which some scientists believe, will, by the turn of the century, produce a dangerous rise in world temperatures with severe consequences, such as melting of the ice caps and subsequent flooding of the world’s lowlands. Such a scenario doesn’t bear thinking about, when one takes into account the elevation of the countless low-lying cities and towns of the world! Your father cared very, very much not about being right, but about avoiding the distress that climate change will cause. Above all else, I think that legacy needs to be taken forward. Think Spencer will pick up on this line any time soon? I thank Sphaerica for his indulgence (though he has missed quite a bit. I wont say 'cherry-picked' because I think he has made a genuine effort. )There is no mention of the development of the basic tenet of the book (ie. The Ratios Principle)or its subsequent and future application. The assertion that A S Gaddes only depended on Australian Rainfall records is erroneous.He very much used Deep Ice Core And Tree-ring data to generate his tables. His discussion of the importance of volcanic activity has not been 'nailed down' by current Climate Science, it is in fact ignored or considered irrelevant. What caused the so called 'La Nina' events in Southern Australia at the time of the eruption of Mt Pucon in Mexico 2011? Or the bitterly cold Northern Hemisphere winter at the time of the eruption of Eyjatjallajokull in Iceland? Finally,(for the moment,) are the forecasts generated by the Ratios Principle correct? If they are then the 'method' must have had something to do with it. It took me many readings to 'understand' this work, I expect it will take those more astute and qualified than myself more than one reading. [DB] Again you continue to prosecute your agenda of curve-fitting without plausible, physical mechanisms for support nor do you provide testable references. As such you are a practitioner of climastrology. As noted earlier, pick the element you feel strongest about & post on it on the most appropriate thread. Further comments of this nature constitute Gish Gallop and will perforce be deleted. Failure to follow this guidance is cause for a rescinding of posting privileges. No further warnings shall be given. While I admitted from the start that I skimmed much of it, I missed nothing. The Ratios Principle is irrelevant to the stated applicability. It does not matter if he used super computers or fairy dust, alien calculus or a child's arithmetic. The bottom line is that he must demonstrate some ability to both mirror past and to predict future global temperature trends, and I see no effort whatsoever to do so, when it should in fact be the centerpiece of everything (not some "Ratios Principle"). I did see frequent reference to the ice cores and tree rings to create his tables (i.e. to identify the "cycles"), but he does not test his cycles against any temperature record of any sort (and, to some extent, testing the output against the input would be cheating and of no value -- I could do the exact same thing with any history of stock exchange records, but with no chance of making a future killing from the results). I did not say that his method depended on Australian Rainfall, I said that his method was used to correlate to it. Either way, it is useless in the climate debate if it is not in some way tied to global climate change, and it is not. If it is, please identify the pages, lines, tables and words that do so. As far as volcanic activity ("ignored and considered irrelevant"), you are simply wrong and you need to do more research. As far as the "forecasts generated by the Ratios Principle"... exactly where are they? They aren't in the book that I could see. That's my major complaint. Where is the testable prediction? Appendices 1 and 2 contain some bizarre and utterly vague forecasts of "dry cycles" in Australia. By what measure? Where are the real world observations that match the truth of the predictions? Where is the math that shows that the predictions are anything more than fabricated data to match some (unrevealed, unclear) observations? And who cares? How does this in any way presume to predict climate change, or the steady rise in temperatures since 1979? I have no intention of reading it again. There is nothing there of value. Again, you are doing your father a grave disservice by using his work to thwart true climate science and forestall action, rather than vice versa. Your material has now been peer reviewed. You have been given specific areas wherein it fails. The next step in the peer review process is to do the hard part, accept and address those errors, and resubmit it to review. Really! Sphaerica has clearly put substantial effort into looking at the work presented; unlike I who glibly dismissed it as gibberish based soley on your posts. You - I and others - should be thankful, show appreciation for the work, thought and time spent; You should let the work either rest where it is or progrss it as advised. to post faint thanks, then faint accusation and then just continue where you left off is not only impolite, but is failing to take advantage of the excellent assistance you have been offered. Neither polite nor scientific. Don Gaddes privilege to post comments on the SkS website should be revoked. SkS is under no obligation to provide him with a forum to publish his pseudo-science. I might suggest a bit of care in posts - While D. Gaddes has pushed moderation limits in repeating ads for downloading his PDF, he has since attempted to put at least some of his theories up for consideration. That said, they (IMO) lack explanatory power, fall into the general category of 'curve-fitting' while bypassing physics, and are not going to provide predictive power. They have not been submitted to, nor evaluated by, any peer-reviewed journals (where peer-review acts as a filter for a minimal level of quality). And now, thanks to the discussion here, that should be clear to unbiased readers as well. Don Gaddes - I believe the objections raised here hold. Without a testable physical mechanism for these cycles to influence climate in some fashion, nor a clear set of testable predictions, these 'ratios' and cycles have little scientific value. With those (if you can for example supply some mechanism wherein the "Metonic Cycle of the Moon's Nodes" affects climate, and/or testable climate predictions), it can at least be evaluated. But that said - the posters on this site have very little patience for hand-waving. Sphaerica#936: And strangely enough, there are 29 papers in G.Scholar for "ratios principle." Unfortunately, none of them have anything to do with climate, sun, moon or the price of tea. See (921) for my answer to the queries on temperature readings (or lack of them. )The Ratios Principle predicts 'Dry Cycles' not Heat Fluctuations.I suspect the current predilection for temperature fixation is just an attempt to 'prop up' AGW. For the queries on Drift of Magnetic Field. It is my understanding that the Earth revolves around the Sun once every Earth/Solar Year, 360 degrees, 30 degrees/month. I believe we are accompanied on this journey by our Magnetic Field. Does the Magnetic Field 'drift, undulate, waft or cavort?' Probably all of the above. I stand by the 'Ratios Principle' and the methods used to obtain it. Apart from my own observations it should be perfectly simple for anyone to check the veracity of the forecasts from 1976 (or before,)to 2011. It is now cold and dry in America, 'physically indicating' the predicted passage of the 'Dry Cycle' due to reach Australia in early January 2012. [DB] "Does the Magnetic Field 'drift, undulate, waft or cavort?' Probably all of the above." Now you resort to trolling by argumentarium. If you honestly cannot understand what you are talking about in this point you must then also summon the intellectual honesty to admit it and then get more knowledge. "Apart from my own observations it should be perfectly simple for anyone to check the veracity of the forecasts from 1976 (or before,)to 2011." Eyecrometers do not cut it in science. You must perform statistical significance tests to provide a scientific basis for your claims. You still practition climastrology as a result. "It appears to affect the severity and duration of 'Dry Cycles.'" "It is now cold and dry in America"
Winter approaches. For many parts of America this means rain, not drought. Or do include the seasons in your collection of semimythical cycles? Either step it up and provide real scientific evidence (via significance testing) to support your extraordinary claims (which bear the burden of proof of extraordinary evidence to support them) or take your agenda elsewhere. Many "alternatives-to-science" blogs exist that will gladly welcome you. "Now you resort to trolling by argumentarium"
regarding "Does the Magnetic Field 'drift, undulate, waft or cavort?' Probably all of the above." I think you are being unfair. This understanding of magnetic fields, along with the above statements regarding gravity, clearly belong in the comments section of the 2nd law thread - just based on the quality of the physics. Don Gaddes#941: "I believe we are accompanied on this journey by our Magnetic Field." That is not what geomagnetism folks mean when they speak of 'drift.' Why not include the 'ratios' based on the earth's daily rotation: 360 degrees per day! "Does the Magnetic Field 'drift, undulate, waft or cavort?'" If you base your ideas on magnetic 'drift,' it would be wise to take a serious approach to that concept - beginning with using the word drift as it is understood. ...the current predilection for temperature fixation is just an attempt to 'prop up' AGW. You must be kidding. Not only do you want to supplant all of climate science with your own vague, incomplete and unsupported hypothesis, but you even want to supplant the metric that global mean temperature is a good (the best) criterion on which to evaluate global climate, and to instead replace it with total precipitation? Except in your case you have only evaluated this based entirely on a simple binary wet/dry interpretation of rainfall in unspecified areas of Australia alone? I would very strongly suggest that if you want to supplant climate science with your own theories, you begin first by learning more about the theories that you believe are wrong but everyone else accepts, rather than focusing all of your energy on the one theory that you believe and everyone else rejects. Of course, sticking to what you know and blindly pushing it with complete and total dismissal of what other people say is the easy course. It's also unlikely to be remotely effective. Your paper has been "peer reviewed." Address the issues or accept that you have failed. Continuing to push failure is not advancing science, it's just being a PITA. For DB [Response] Yes, the Seasons (Obliquity) are included in the Equation as No.2 Constant. "By late 1991/92, very dry conditions were developing over parts of eastern Australia, though the southeast had some very wet spells and flooding in the winter of 1991 and summer of 1991/92. The 1991/92 Wet season failed over most of northern Australia -it was the driest Wet season on record in the Northern Territory. Generally dry conditions persisted through the first half of 1992. But between late 1992 and late 1993, El Niño conditions waned, waxed, then waned again, with heavy rain and flooding over southeastern Australia during the two waning phases. Over Queensland, however, the drought continued unabated through this period, and extended south over eastern New South Wales, setting the scene for disastrous bushfires in January 1994." The mean over that period is 465.7. I have indicated wet years under the mean, and dry years over the mean by bolding. As can be seen, by this 1/3rd of predictions are false, and some by very large margins. (The probability is slightly worse if 1980 was supposed to be a wet year, as is likely.) Assuming all years where predictions, the probability of achieving that result by chance was 9.2%, so the results are not statistically significant. Given that at least half the results are retrodictions, the performance is singularly unimpressive. In other words, Don, you're pushing failure. Oops, seems like it's now operating,excuse my Paranoia. [DB] You were warned here to provide significance testing to support your claims. Failing that, to provide links to peer-reviewed articles published by working scientists in the field in scientifically relevant papers (in this comment here). The comments that you posted that failed to follow this course of action were deleted. As will subsequent comments, unless you step it up with the requisite testing and citations. Nothing you have presented thus far meets those standards. "Read the book to see what the book says; questions can be answered by studying the book more." A continuation of this course of action is simply wasting everyone's time. Whoever decides to further research and expand this work will be in for an exciting ride. As it stands now, there is no value or substance whatsoever to the work, and trying to sell something that is 1/10th baked is never going to work. Why do you appear to be pleading for someone else to pick this up and finish it? That job falls to you. No one else is going to spend the time, and this site does not exist to help you find someone else to pursue your fantasies for you. Don Gaddes @948, Victoria is part of Australia, but the retrodictions/predictions where for Australia, not for Victoria. Ad Hoc alteration of the prediction after the event to avoid falsification is no reason for confidence in the theory. Defending your father's theory on the basis that he did not have enough information develop an accurate theory impresses still less. Consequently the only information I am interested in from you is, what was the date of the predictions listed by Sphaerica? Where they all, as I suspect, hindcasts?